A new poll commissioned by Fox News shows the special election Senate race between Republican Ray Moore and Democrat Doug Jones to be a deadheat, at 42-42. Two other recent polls have shown Moore's lead to be in the single digits at 6 and 8 points, both within the margin of error of those polls. Moore and Jones are fighting for the former Senate seat of Attorney General Jeff Sessions, which was held temporarily by former Alabama Attorney General Luther Strange. When this seat was last on the ballot in 2014, Sessions won with over 97% of the vote when the Democrats didn't even bother to field a Senate candidate in ruby red Alabama. Two years later, Republican Richard Shelby won re-election to his Alabama Senate seat with 64% of the vote while, in the presidential race, Trump won 62% of thevote in Alabama, besting Hillary Clinton by 28 points. Unfortunately for Jones, the surprising closeness of this race is a double edged sword. While it means more money for his campaign, it also means more publicity on Jones' more unpopular positions on such issues as abortion and guns. 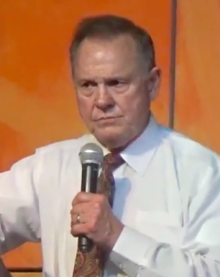 While Moore has been tarnished by the recent revelation that the former Alabama Chief Justice successfully fought against repeal of a (no-longer enforced) segregation clause in the state Constitution, Jones' being pro-choice and against gun rights may prove worse offenses to Alabama voters. Further, close polls mean the race becomes nationalized and that is not good for Jones. He does not want to have to defend Democratic leaders and coastal liberals Nancy Pelosi and Chuck Schumer. If Jones could convince Alabama voters he is a moderate to conservative Democrat, then he could pull off an upset. Unfortunately for Jones though, he is not a moderate to conservative Democrat. He is liberal, i.e. progressive, Democrat trying to win in very conservative Democrat. Breitbart's Steve Bannon enthusiastically supported Moore in his primary win against Strange. He is exactly the type of bomb-throwing candidate that Bannon wants running all over the country, challenging "establishment" Republicans in primaries. If Moore loses in Alabama, or if he only wins narrowly, that should send shock waves through the GOP about the dangerous approach Bannon is taking. The Moore-types can win primaries, but can they win general election, especially if they are not in heavily-Republican states? Doubtful. I guess you missed Tom Huston's rejoinder to Mitch McConnell's deception. "Conservatives should keep in mind that among the McConnell non-endorsed Senate candidates who "couldn't win" were Ted Cruz, Marco Rubio, Rand Paul and Mike Lee. The Republican Congressional Establishment is a conspiracy of fraudsters devoted to maintaining their own power. Ousting McConnell, Ryan and their enablers is a must if there is to be any prospect of enacting a populist conservative agenda." I think he has the better argument. Moore has a muddled brain on foreign policy, like nearly all Republicans, whether RINO or anti, Trumper or Never. Of course the Dems go along with it too. We are curious about how Moore feels about Steve Bannon having made money distributing Harvey Weinstein’s Pro-Transgender movie: “TransAmerica”. Be interesting if anyone ever calls Bannon out on this.